Why Chios? 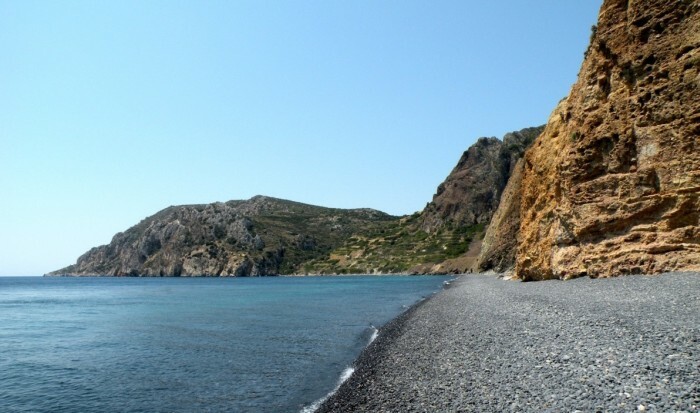 The story of the Chios Island tempted me a few years ago, when I was looking for ideas for summer vacation. Why Chios? The story of the Chios tempted me a few years ago, when I was looking for ideas for summer vacation. Many of the people were talking about it, that when you come to the Island you feel that nothing special is here and maybe you are disappointed a little bit, but when you begin discovering the island, you are impressed. So we decided that we have to explore this Island and we did it with three preschool children. Chios is a fifth largest Greek Island situated in Aegean Sea, the Island with many stunning medieval Villages and breathtaking views. The Island is full of gorgeous bays and beaches with crystal clear water and pleasant people. The Chios Island is not so big, because of this, one week vacation is enough for seeing the whole Island. We began our tour around the Island from the capital town, where is also a smaller airport. The Capital Town has the same name like the Island – Chios, but domestic people call it Chora. Originally, the town was built on the north side of the natural harbour. 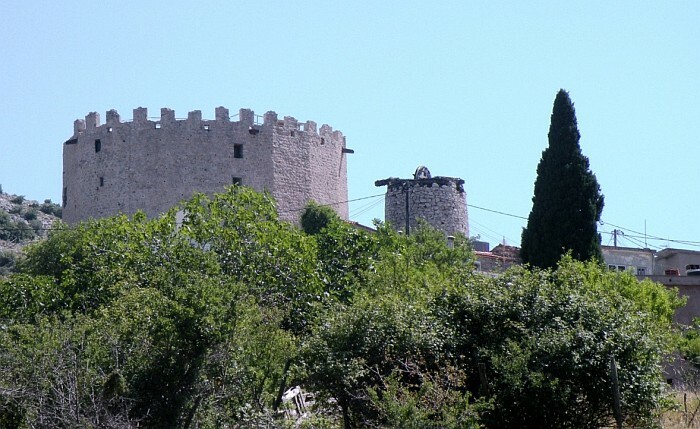 The castle originally encompassed the entire city and later the town has spread outside the walls. 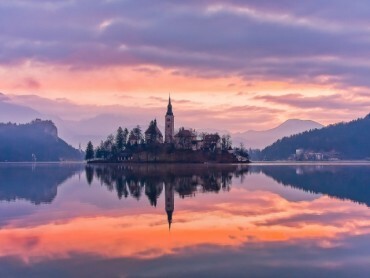 The city has been inhabited since the Bronze Age. Following the devastating earthquake in 1881, the city was renovated. Therefore a large part of the coast and outskirts of the city is built in a modern style. The current city extends well beyond the walls and even spreading to the north and south. The centre of the city is still between the castle and the port, where we can find several museums, the main shopping street and the municipal gardens. In the city is also one of the oldest and the most beautiful monastery in Greece – Nea Moni. In 1990 Nea Moni was included under UNESCO protection. The city is full of chaos, traffic jams, cars are rushing one over another and therefore is very hard to find free parking. Because of those reasons it is better to go to the city with the bus. 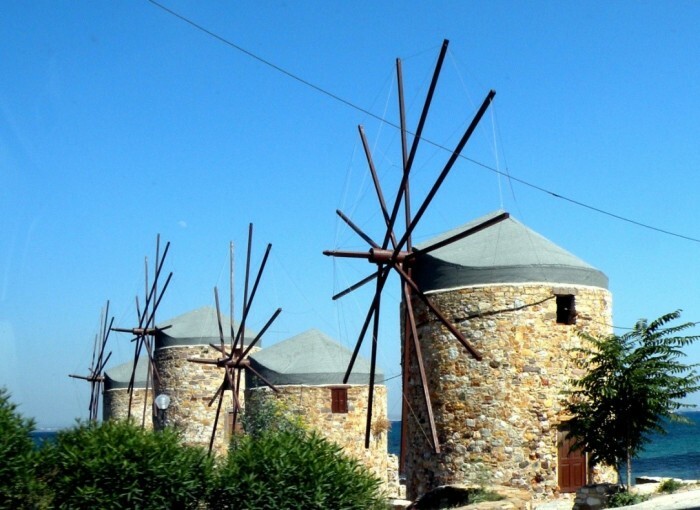 In the city is also definitely worth to visit the famous stone windmills, which are situated along the coast. If we go to the south then we come to the area of Karfas, which is situated about 5 minutes away from the airport. Karfas is a small town and it is the most popular destination on the island. There we find some hotel complexes, shops, restaurants, clubs and night life. The town boasts with a beautiful sandy beach, which is the longest on the island. The beach is ideal for small children because the sea depth is gradually increasing. On the beach the children can play carefree, build castles, play tennis or something else. 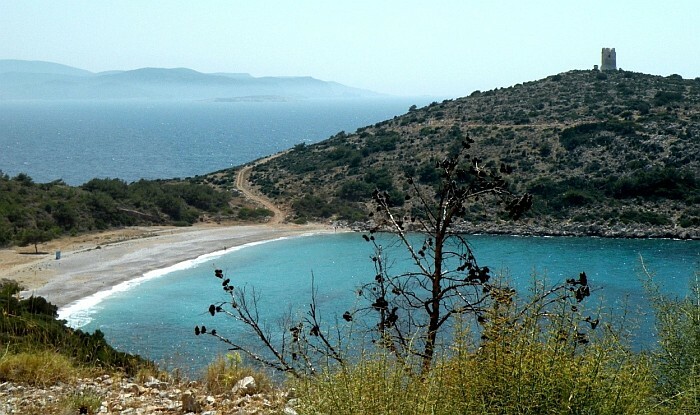 In the end of June we cannot feel that the area of Karfas is the most-visited place on the island. There aren’t so many tourists, so you haven´t got a problem with finding some free sun beds and umbrellas, of course you have to pay for it, around 6 euro for the whole day. On the southern side of the Island we come to the small marine village Emporio. In the village we find some taverns, where we can refresh ourselves with some good local drink and delicious locale Greek food. Next to the tavern is also a small beach with black pebbles. 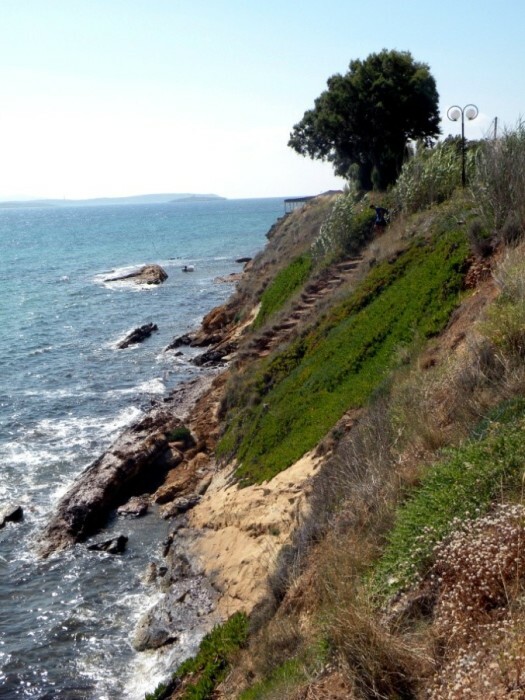 Then we continue our route to the beach Mavros Gyalos or Mavra Viola, like the locals call it. 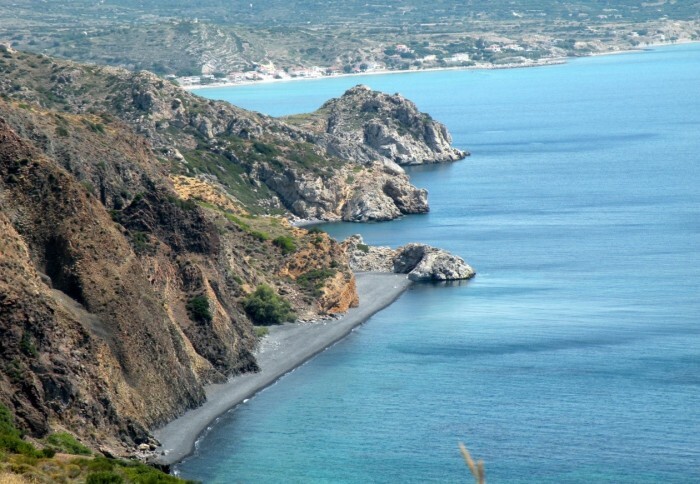 The name means black beach, because of black pebbles and sand from the extinct volcano. This beach has a crystal clear water, a little bit colder but magnificent. If you are a little more adventurous, you can explore macadam roads, there are a lot of them. After the ride on one of those terrible macadam roads, between the Mastic plantations, which look like a hole next to the hole in the hole, we are coming to the end of the cliff. On this cliff, in front of us, an excellent, breathtaking view is opening on the beach Mavros Gyalos. View on the beach Mavros Gyalos. Continuing our journey through the island, we come to the village Pyrgi. 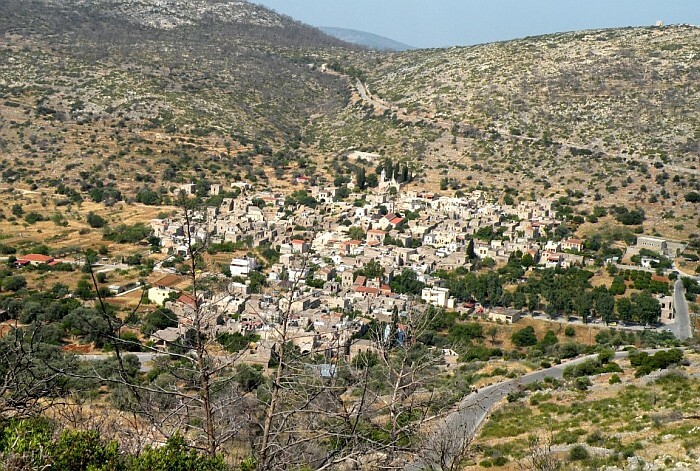 Pyrgi is one of the most gorgeous village on the island, which is 24 km remote from the capital town Chios. 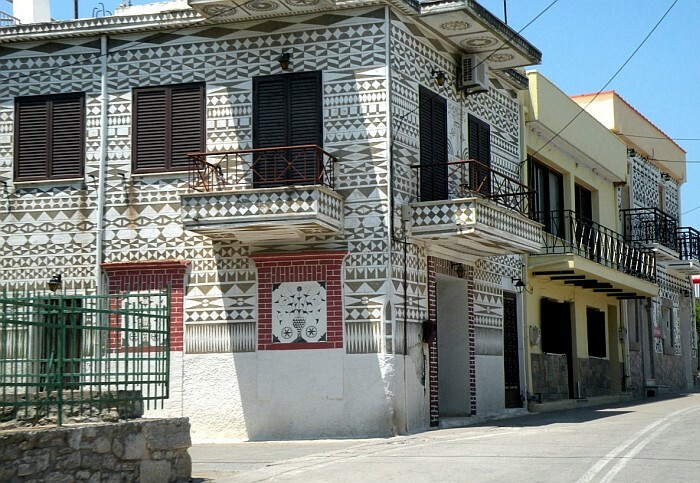 The village is famous for its houses which facades are decorated with grey-white geometric patterns. Those patterns are made with plaster of black sand and coated with lime. Then this lime is carefully scratched down in patterns, so that they reveal the black base. 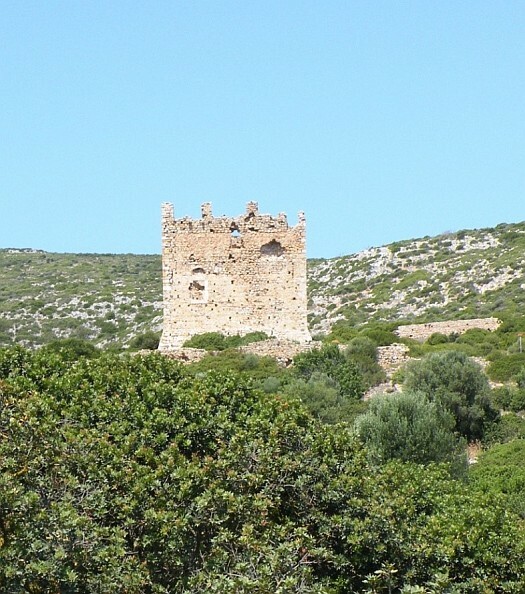 This village is named after the central medieval tower which still stands in the village and preserves the traditional architecture. The residents of the Pyrgi are mostly living from the agriculture and with the products of mastic. Mastic was already the mostly profitable product in the Middle Ages. The Mastic is a gum which is obtained from the Mastic bush. When that gum is dried, people scrap it from the bark and recover it for different purposes. Very tasty is Mastic liqueur, the Mastic is added in to traditional anis spirit OUZO. It is also used in the cosmetics and also in toothpastes. I was surprised when I saw the coffee with the Mastic addition. On the western side of the Island we are blown away with the breathtaking view on the village Vessa, which is perfectly blended with the nature. Vessa is a very well preserved medieval village. In the village are stone houses. Nowadays, many of the houses are outdated and empty. In the village is the church Petrousena, which is considered as the most ancient church on the island. After driving over the hilly countryside, we stopped at the beautiful sandy beach Lithi. There is also crystal clear water and shallow sea, which is ideal for small children. 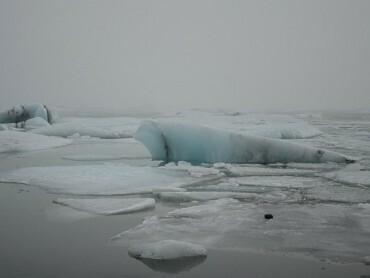 Here the weather was pleasant because there was no wind, for the first time in the island. But because of this, it was very very hot. In the background of the beach we find some taverns and bars, which offer fresh prepared traditional Greek food. The locals are very friendly and helpfully. 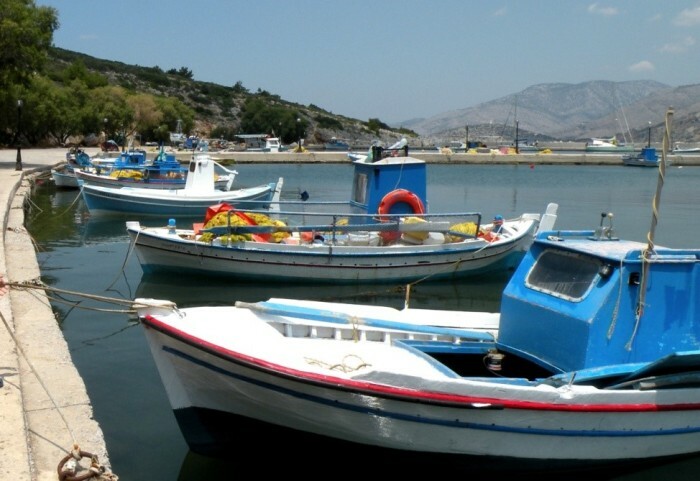 Near the beach is also a small picturesque harbour with the typical Greek fishing shuttles. A little bit north of the Lithi is the wild beach Trahili, which beauty takes over you already at the sight on it from the road. It´s famous for its crystal clear water and if you pay a little attention on the shape it looks like the form of the heart. The beach represents the left side of the heard. On the hill next to the beach, you can look closer at the Watchtower. In the past those Watchtowers, which are built in many places around the island, were intended for the control of the coast and protecting residents before pirates. Higher in the north is also a beautiful beach Elita, which is famous by the most gorgeous beach on the island. It´s really beautiful but there is a problem with hornets and wasps, because near the beach are sources of fresh water. Because of this fact, this beach is the most popular between locals. Actually all over the island you have to be aware of the bees, hornets and wasps, but this should not be the reason why you would not discover this beautiful island. After seeing fascinating views on the beaches we went to the north-eastern part of the island, again to the hilly interior. When we came to the medieval village Pitios, we were shocked how modest the locals are and here you can see how little is needed for happiness and satisfaction. In the village Pitios we went through the narrow streets between small stone houses and we got the feeling that the time here stopped a long time ago. Here mostly live senior people, because the younger ones moved to the coastline. When we get to the east side of the island, we saw another picturesque fishing village Lagada, where the locals reach very high ages. The locals lives are modest, without stress and especially they take the time for themselves and their family. Here the tourists can book a room or an apartment and enjoy in the leisurely village and delicious fresh seafood in the taverns next to the beach. The most recognized attraction in the village, which also decorates the postcard, is a small church of Agios Isidoros. 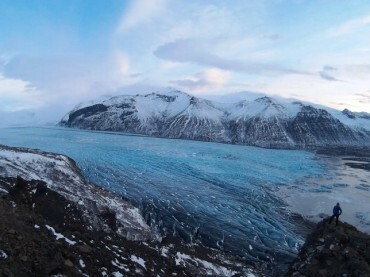 Why to Travel to Iceland in Winter?